There are a few things you really need to see first hand and to touch in order to appreciate their true nature. A Broseley stove is one of them. This way you can have the pleasure of examining and comparing these pieces of technology, understand how they work and picture how agreeable they might fit in with your lifestyle. A cast iron gas stove, such as the Broseley Lincoln, with real flames arising from hand crafted ceramic fibre logs or coals, the flame picture is incredibly similar to the real thing. The heat is comparable in quality, radiating through the cast iron body of the stove. The Broseley Lincoln is distinctive for its double doors with Victorian detailing to frame the flames inside. But what sets this stove apart from any other gas stove on the market is that the doors on the Broseley Lincoln can be run with the doors open, while not effecting the efficiency of the fire. 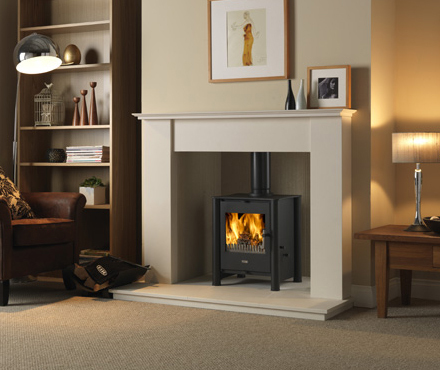 For a slimline stove its 4.6kW output is more than adequate to heat a typical room and with the balanced flue version, the Lincoln could be installed in practically any room of the house. Thermostatic operation optimises fuel consumption while the remote control gives you the freedom to change the view from balzing to smouldering and back from practically anywhere in the room. Verine has always had a reputation as a manufacturer of some of the most efficient fires on the market. Now they are setting new industry standards with the Verine HE high efficiency range: exceptional heat output combined with lower running costs compared to standard gas fires. Verine's R&D team has invested in developing the technology to meet the key objective of producing gas fires that save energy and as a result, help keep costs down. So how does a Verine fire work? HE inset gas fires provide a hight efficiency as they produce both radiant and convect heat. Radiant heat is generated by the fuel bed and reflected into the room by the glass front of the fire. At the same time convected heat is produced from cool air which is drawn through a heat exchanger and emitted through a canopy at the top of the fire as warm room air. The Verine Orbis HE and Midas HE are the two most efficient gas fires from Verine, both offering a staggering 89% efficiency, while the full depth Orbis HE has a 4kW heat output and is suitable for Class 1 or 2 Chimneys and Flue, the Midas HE is also suitable for a precast flue and will give up to 3.2kW of heat output. Both these fires are available in a wide choice of trim and fret finishes so the same fire will look stunning in both a traditional and contemporary setting. Both the Verine Orbis HE and Midas HE are also available with a choice of hidden manual control or convenient slide control and boast the 5 year guarantee that makes Verine fires so special. Also available from Verine is the Meridian gas fire which boasts an efficiency rating of up to 84% with a highly realistic log fuel effect. The Verine Meridian is available both for standard Class 1 or 2 Chimneys and Flue as well as in Balanced Flue, for houses without a chimney. Boasting remote control as standard, the Meridian can be controlled without having to get up from your armchair. 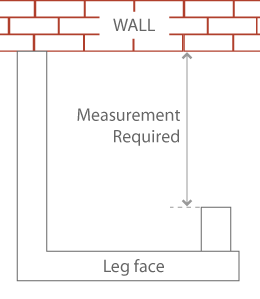 The DRU Metro 80e can be installed into an existing or false chimneybreast. 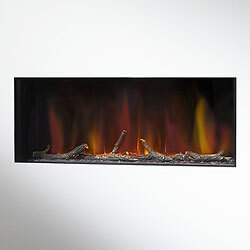 It has a frameless design with a full width, glowing fire bed, together with a unique, realistic LED flame picture with choice of twigs or pebbles. Like all of the DRU Electric Collection, the Metro 80e is operated by remote control. The flame picture only requires 15 watts of electricity, less than an average light bulb! This makes it both practical and economical to use. There are16 flame height settings and up to 100,000 different flame variations. 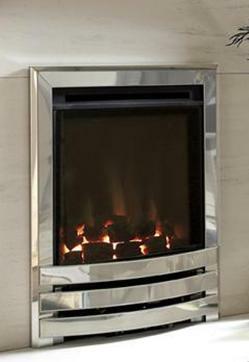 The Metro 80e can be used simply as a decorative fire or it can be adjusted to produce up to 2 kW of heat. Metro 120-e is an electric version of one of our most popular luxury gas fires. It is for homes that want the beauty of a classic fireplace without the expense of gas connections and chimney conversions. 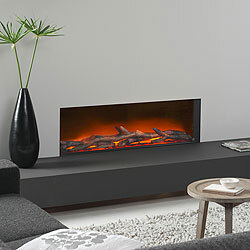 Metro 120-e e has an impressive flame picture created using LED technology that replicates the warm glow of a real fire. At 1.2 metres wide it is the largest electric fire in the DRU collection. It can be used simply as a decorative fire during the spring and summer, but will also provide either 1 or 2 KW of heat during the winter months. 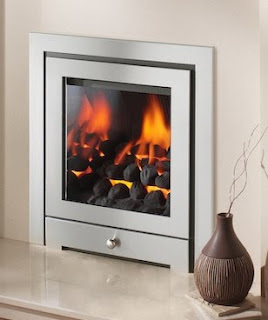 Like all DRU fires, Metro 120-e is glass fronted with a remote control for easy operation. In 2006 we saw the Debut of Daniel Craig in ‘Casino Royale’ as the new James Bond in what was actually the 21st film in the Bond series, and I’m proud to say that the Gallery Large Nexus Basket (as right) made a fantastic impression as it set a light in a tense character building scene between M and the new blond 007, the scene was is actually the first time that M’s home appears in any of the Bond films after 007 breaks in to use her computer. And speaking of famous Gallery Firebaskets keep a look out in the queen Vic on Albert square for the Small Cottage basket (as above), some time ago during one of their comical escapades Gary and Minty fitted this fire for Peggy, please take this as a lesson of how not to fit a fire, always speak to your retailer and make sure a competent Hetas or Corgi fitter completes your installation! Carbon monoxide is a highly poisonous gas that has no colour, taste or smell, making it impossible to detect without an alarm. Carbon monoxide alarms must be audible – they make a loud noise if gas is present. We do not recommend the use of ‘Black Spot’ indicators as these are not as accurate and will not alert or wake you if there is carbon monoxide in your home. Carbon monoxide alarms are available from £15. They can be bought at DIY stores and some supermarkets, or directly from energy suppliers. When you buy a carbon monoxide alarm, make sure it meets current European safety standards. Look for alarms marked with the ‘EN50291′ standard. This may be written as BSEN 50291 or EN50291 and with the ‘CE’ mark, both of which should be found on the packaging and product. Alarms will have either a Kitemark or Loss Prevention Certification Board (LPCB) logo to show independent testing and certification. You should never ignore a carbon monoxide alarm. Check the manufacturer’s instructions to make sure you can recognise the alarm sound emitted when carbon monoxide is present as well as the low battery signal to avoid any confusion. If the alarm sounds, call the relevant fuel advice line for help and seek medical advice urgently if anyone is feeling unwell. If you are a tenant, carbon monoxide alarms may also be available to you from your landlord or local council. If you are worried about the threat of carbon monoxide poisoning whilst on holiday in the UK or abroad, you may wish to take a battery-operated carbon monoxide alarm with you. Just take out the batteries whilst travelling. The same battery alarms can be used at home and on holiday. Napoleon® Grills – new to the UK but thirty-six years in the making. There’s a new kid on the barbecue block and it is comes with every knob, grate, grill, bell and whistle you can imagine. Designed and refined in Canada, Napoleon® Grills offers a premium range of charcoal and gas barbecues that has been developed over many years to meet the demands of the North American market. The Napoleon® Grills gas barbecue range takes no prisoners. The focus is on packing a punch with features included as standard – not as extras, yet with prices that start at just £449 for the SE series. Napoleon® Grills uses the best materials; double-lined steel lids means they hold their heat and add strength and durability. There are large cooking areas with warming racks; side burners are standard and perfect for side dishes and grates are cast iron – the best material for transmitting heat evenly. Ignition is electronic, there’s utensils holders, bottle openers, temperature gauges, the list goes on and all as standard. It does not need to cost much more before rotisseries, ice buckets, cutting boards and infrared SIZZLE ZONE™ for perfectly seared meat, also become standard. Take the LE, it even has backlit control knobs, and two halogen lamps at the back, darkness is no excuse to stop grilling! Top of the range and retailing at £3499 is the Prestige II PT750. This is engineered to meet the exacting standards of the died-in-the-wool barbecue enthusiast. The PT750 is not for lightweights, but for those that like to buy the very best tool for the job and truly enjoy outdoor living and cooking. There are two quite separate cooking zones each having its own lid allowing the chef to use just some or all of the grill depending on numbers. There are a total of six burners, including a side burner and infrared SIZZLE ZONE™. Its specification ticks all of the boxes and without doubt it will impress the neighbours! The best of both worlds? Why not. Check out the Charcoal Smoker Tray it turns a gas barbecue into a charcoal one and can be used in conjunction with several gas barbecues in the Napoleon® Grills range. A full selection; charcoal starters to get barbecues going, covers to protect and scrapers and brushes to clean and maintain. Tongs, forks, slices, basting brushes – all the standard tools the griller expects and needs. Cooking aids such as fish baskets, woks, chicken roasters, toppers, shish kebab sets, pizza stones, rib pans, frying pans and griddles. 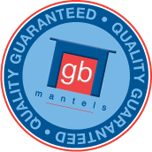 GB Mantels Ltd. is a leading manufacturer of timber fire surrounds with an established reputation for quality and excellence. Based in the heart of Yorkshire, their modern factory blends the latest technology with the age old experience of quality British craftsmanship to create the most versatile and varied ranges of wooden mantelpieces available today. Established now for nearly 15 years, GB Mantels aim to stay ahead of the market by introducing stylish and original designs manufactured in Yorkshire using only the most reliable and majestic woods sourced from around the world. The beauty of natural timbers ensures that each mantel bears distinctive hallmarks bestowing its own unique character and identity. The current GB Mantels collection offers over 50 mantelpieces with a full range of designs from classic to contemporary to the distinctively ultramodern. So let GB Mantels help you to create that warm welcoming fireplace you’ve always wanted, then sit back and relax safe in the knowledge that your fireplace has been crafted from the finest natural materials and treated with absolute tender loving care. What does ‘fireplace rebate dimension’ mean? Understanding the fireplace rebate you require is essential in ensuring your fireplace/fire will fit your required application. 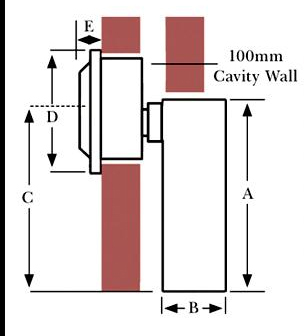 The dimension you need to work out is the depth needed to fully recess you fire against your flat wall or in your chimney recess. If the fireplace is being fitted against a flat wall then the full depth of the fire needs to be recessed within the fire surround. However, if the fire surround is being fitted against a chimney then the depth of the fire can be recessed within the cavity of the chimney. A new fireplace is an exciting addition to any home. 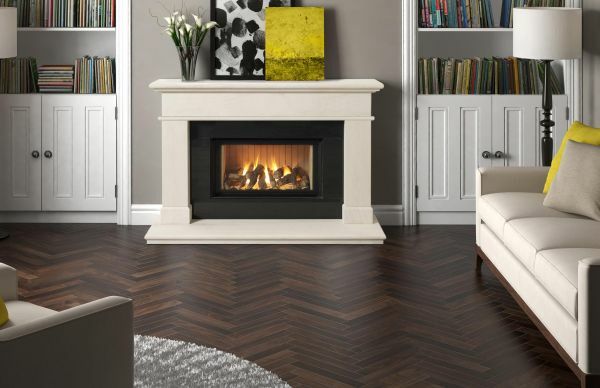 Whether you are buying a fireplace to enhance your decor, heating, or both, there are many options available from us here at Fireplaceworld.co.uk. From easy to use and install electric choices to clean and efficient gas fires, our fireplaces are available in attractive and varied styles that will add beauty and style to any room. Choose with care. Fireplaces can last for many years and often increase your home's value. Be sure to select a fireplace with the technology and performance you’ll want long term. Take advantage of our many years of experience to make what at first appears to be a difficult purchase a simple and enjoyable experience. Your key consideration will be whether to purchase an electric fireplace or stove, or gas fireplace. Make sure you choose the size and style that is right for your needs. In the past, it may have been necessary to choose between these two goals. Today electric and gas options provide both ambience and efficient heating. However, if you are on a budget, you might find that you need to be willing to prioritise a bit. For example, you may have to choose a less expensive mantle design in order to afford a large enough fireplace to heat your room properly. There are as vast a range of fireplace styles as there are interior design styles, spanning from casual to more formal looks. 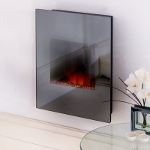 Regardless of gas or electric, fireplaceworld.co.uk offers many choices. The material and style of the mantel or surround will play a major role in a fireplace’s appearance; though keep in mind that you may need to purchase these separately. Whether you like clean lines or ornate details, rustic or contemporary styling, we can provide a beautiful fireplace that suits your taste. For both electric and gas fireplaces, with the flick of a switch or even a click of a remote control, you’ll have your fire and heating source working in an instant. Fireplaceworld.co.uk are the UK’s largest retailer of electric and gas fireplaces, offering the convenience of online shopping with home delivery, or the opportunity to visit our showroom to select and/or collect your purchase. The winner for a realistic flame is, of course, a real flame in a wood burning fireplace. Today however, through the use of updated technology, you too can experience a beautiful and realistic looking flame effect. Purchase one of our electric or gas fireplaces and benefit from a warm room and the good economy of saving on heating costs. Keep in mind that high ceilings, as well as square footage, will play a part in heating ability. Other factors include home insulation and the number of windows. Overall, the larger the room, the larger the fireplace needs to be to heat it well. Of course, if you are buying a replacement fireplace for an existing chimney area, this will determine the size needed. Our high quality fires and fireplaces include the following features: strong and solid construction, heavy duty faces, quality materials and CE-certification. In gas and electric fireplaces, realistic flames are another measure of sound workmanship and quality. Our fireplaces are designed to increase heating efficiency. Keep in mind that gas fireplaces are subject to rigorous safety codes and installation should be carried out by a gas safety registered installer. They also require regular maintenance in order to operate properly and safely. It is vital to have a gas fireplace installed and maintained by a qualified, licensed, and experienced professional. Electric fireplaces generally need no installation other than plugging them in. Electric Suites are complete, freestanding, electric units. They are the simplest type of fireplace to install. In fact, you could describe them as 'Plug and Play'! All you need to do is place the electric suite in the correct location and plug it in. Nothing could be simpler. You just need a flat wall and a nearby plug socket. There is no need to inset the fire into the wall, so there is no mess or fuss. 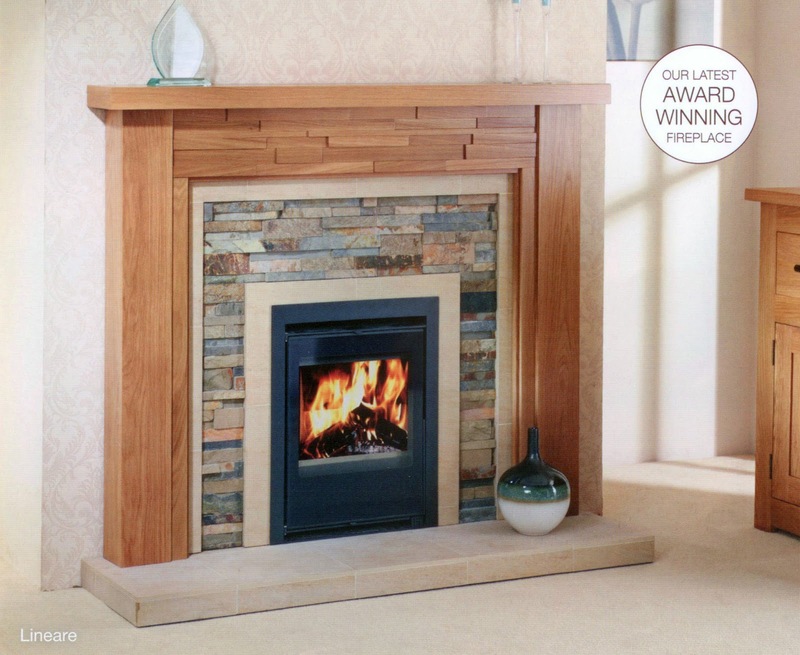 Ideal for anyone who wants a complete fireplace, with the minimum of effort, at an unbelievable price. Most Electric Fires and electric suites have a 1kW and 2kW setting, but you can also have the flame effect or light on without any heat being emitted. This is ideal if you want to give the sense of warmth without actually using the electric fan heater. 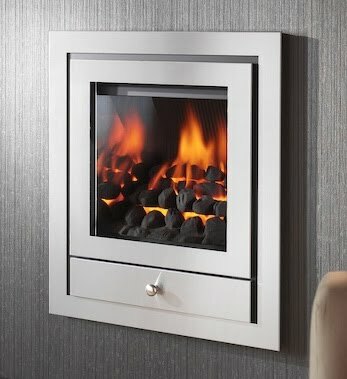 Ranges of wall mounted electric fires are designed to be installed up off the floor, wall mounted for maximum impact and maximum style for your home. All our Electric Fires and electric suites have a 1kW and 2kW setting, but you can also have the flame effect or light on without any heat being emitted. This is ideal if you want to give the sense of warmth without actually using the electric fan heater. 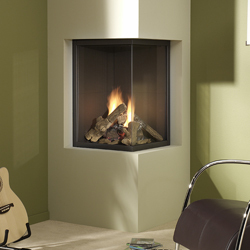 All of our inset Electric Fires are extremely flexible. They are designed to be inset into a backpanel with the standard opening of 22" high by 16" wide, but can also be used as a freestanding unit. Again, these electric fires are simply plugged into a mains electrical supply. This allows the fire to be fully freestanding, semi-inset or fully inset. Most Electric Fires have a 1kW and 2kW setting, but you can also have the flame effect or light on without any heat being emitted. This is ideal if you want to give the sense of warmth without actually using the fan heater. A Living flame gas fire is the staple of the fireplace industry. Being much cleaner than solid fuel, and giving out more heat than an electric fire, a gas fire is the optimal choice for most homeowners. However, all gas fires available do not necessarily fit all types of flue system. Our gas fire guide will help you to understand what flue system you have in place at present, and which types of gas fire are suitable. If you have no flue at all, don't worry! 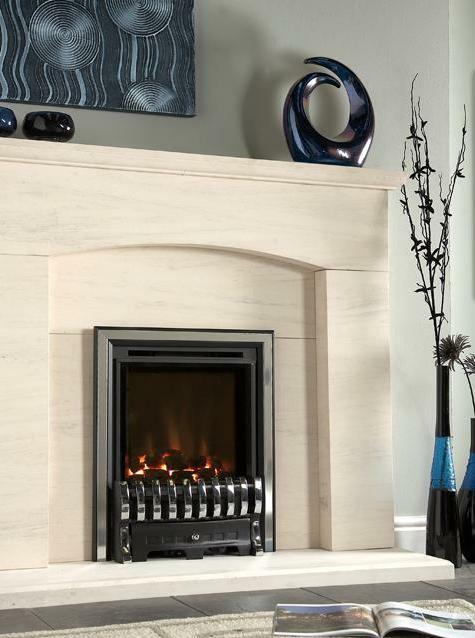 We have gas fires with catalytic technology, fan flue or power flue systems to accommodate any situation. They also come with a choice of trim and fret so you can give your living flame gas fire whichever appearance you prefer. Another popular line is Limestone fireplaces range, imported directly from Portugal or Turkey. The demand for these products is so high because of the natural beauty of limestone. However, many do not understand that this is a natural product and so every piece of limestone is unique. Limestone is actually made at the bottom of ancient oceans, by the gradual layering of marine organisms on the seabed. As a result, natural limestone will contain fossils, coal seams and fault lines. This is part of the beauty of the product. There will never be an exact replica of your fireplace. Please note that the sizes of each fireplace may vary due to manufacturing. 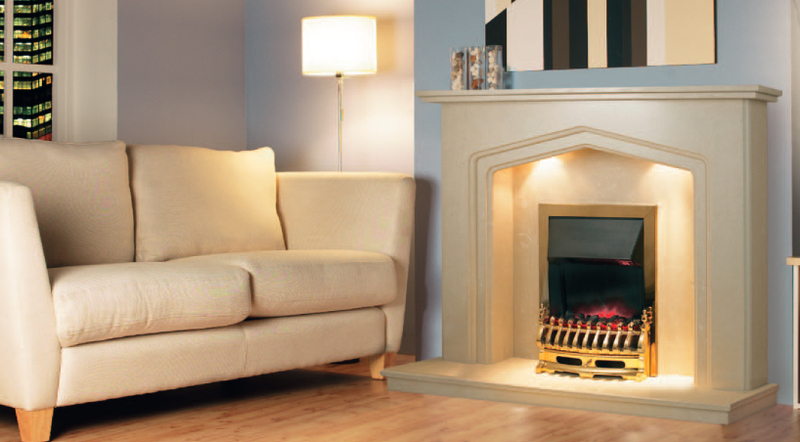 The solid fuel limestone fireplaces are not recommended for high usage with solid fuel. We only recommend occasional use. Limestone is naturally porous and will age (discolour) and mark over time with the use of solid fuel. Please make sure you are happy with limestone as a solid fuel product before buying. Opened in the '70s by the Wells family, A.J. Wells & Sons Ltd. Back then, no one then could have guessed that one day a small company could become one of the most important sources of income on the Isle of Wight. However, as the times changes the workshop expanded its business for the sale of free-standing stoves. And so it began.Alfred Wells, father of the current director, John Wells and now retired Alister Wells (director of production), founded the workshop on 16 February 1972, located in the village of Niton, on the above-mentioned, the picturesque Isle of Wight. In addition to auto repair, workshop dealt with agricultural equipment repairs, manufacturing, gates, balustrades and handrails, and emergency exits.In the seventies Britain facing a crisis, as a consequence there has been a rise in oil prices. Then its toll also met Dutch elm disease, which has caused wither about 25 million trees across the country. These two economic factors contributed to the fact that the family, interested in free-standing stoves and soon began selling them.Offered by heating devices have one significant drawback weakening sales - too large size. Customers wanted to have a smaller furnace and it was at their request, Alfred and his sons - a trained engineers - they decided to design the stove. And that was Beacon - The first Charnwood.The device is selling well, which contributed to the development of the company. It took the new manpower and greater accommodation. For this reason, the company, located just on the surface of 139 m2, in 1980, changed its office in Newport - where there was a slightly larger plant.In the 80s Most enamel finishing was carried out by local businesses. However, it was difficult for reliable subcontractors, so the company decided to invest in their own enamelling equipment. Quite unfortunately happened that shortly after this investment, another crisis hit Britain and sales plummeted furnaces. The Wells family was forced to look for new jobs. In this way, managed to win a tender for the London Underground, for which today produces enamel signboards and various characters (a division Specialists Signage & VE).In 1997, the factory moved to the seat, which is today, a company has 4645 m2 area. Although a greater number of employees, A.J. Wells & Sons Ltd still remains a family business. Currently, the company manages the second and third generation of Wells family members. In the past, for 16 members of the family were all working at A.J Wells at the same time. There are differences of opinion between them. Fortunately, on matters of opinion there is no difference. Undoubtedly, the great advantage of a family business is that it is composed person can fully trust each other. In addition, the management of large plant requires the involvement of staff at various levels and levels, and the family atmosphere fostered by. Although not all of today associate the name A.J. Wells & Sons Ltd - in turn Charnwood brand is well known in the global market.Wells factory is located in three buildings: the largest, single-storey production hall is Charnwood stoves, with office space on the first floor. The second building is a warehouse, which stored up to 6000 devices. In the last formed enamel and metal department, and at the floor, in the so-called. studio houses a permanent exhibition of products and training room. In addition to study is quite interesting room where you can see the imitation of the London Underground station (called by most workers - station Wight).The company A.J. Wells & Sons Ltd, in addition to Charnwood and enamel, consists of two divisions dealing with the import and sale of chimney systems, and Fair Trade products Bodjani. The business operates in this manner supports small family company in Cambodia, since the terracotta tiles and hand-woven baskets Bodjani manufactured in Asia.The production process begins with the body sheet metal with laser cutting machines. Then cut elements are formed using presses and welding. Welding line is divided into several stations, where each welder combines certain elements. This increases efficiency and allows fine control of the quality of the product, in the case of any errors - also respond quickly. Some welding is done using modern robots. After initial purification reach the sand bodies, which are for a period of 3 - 7 minutes. Metal shot gives them a specific finish (the so-called. Peel oranges). After this step, the body reaches the paint, and then into the tunnel, where it is pre-dried. As in the case of welding, the assembly line is equipped with special rollers. The body is moved and gradually increases are the other elements. Before the oven is completely folded, it is re-coated and dried. Are installed at the end of the other internal components and windows, and the furnace is given a serial number, confirming compliance with the quality standards. Then, the machine goes to the store.Currently branch Signage & VE Specialists, in addition to furnaces, enamelling deals with stoves, bathtubs, but most of all the panels and characters. Performs order companies and individual clients. This sector is also working with a group of artists who perform a very interesting project: an example could be the work of a well-known Laura Boswell and Michael Forrest. Among the customers, but the London Transport Company (London Metro), include, for example National Railway, ABB - an international working group including in the automation industry and energy, BAM Nuttall - a company in the construction and engineering.Using the highest quality materials piecom Charnwood provides high strength, attractive appearance, and above all, excellent heating properties. Selected raw materials come from local UK market. Most parts of the furnaces and basic accessories are manufactured in the factory on the Isle of Wight. The exceptions are the elements iron, which comes down from the middle of England (Birmingham), and glass - Schott shipped from the factory in Germany. With this independence, we can fully control the production process and the quality of equipment.Charnwood has won numerous awards. In 2009, the company has received, from the hands of the same Elizabeth II, The Queen's Award - for excellence in the field of international trade. The prize entitles the winner to use the royal logo in all promotional materials for the next 5 years.The Company continues to invest and modernize its plant. Over the past three years paved the capital nearly 4 million pounds of modern, high-tech machines (presses, welding robots, laser cutting) and the modernization of the production line, making almost double increase in performance.Annually, A.J. Wells & Sons Ltd sells about 20,000 stoves Charnwood, which represents 80% of company revenue. The remainder of the budget is income from enamel and - to a lesser extent - with branches importing chimney systems and products Bodjani Trade.This year is a special time of up to five reasons. First, the company celebrated the 40th anniversary of their business. Secondly, family-owned company has been recognized by an independent bimonthly "Sublime Magazine" as "Outstanding Company 2012". Third activity A.J. Wells & Sons Ltd was awarded The Print & Design Awards 2012 - the directory Charnwood, who won in the category "Best use of recycled paper." Fourth, August 13, 2012, His Royal Highness, the Duke of Edinburgh, Philip visited the headquarters of Charnwood. Finally, the two branches of the fifth - Charnwood and enamel Signage & VE Specialists - were invited to participate in an exhibition at London's Science Museum, which promotes British manufacturing industry. The company was among 39 exhibitors (including next brand Rolls-Royce, Jaguar, Land Rover).Charnwood also won numerous local awards in the field of ecology. The Company does not underestimate the impact of their activities on the environment. Therefore, the factory has introduced an integrated management system that focuses on two aspects: quality control and nature conservation. It is based on the international standards ISO 9001 and the environmental impact of ISO 14001.The company helps local businesses using their services, and supports initiatives rustic - Charnwood is a local sponsor for the club rugby. In addition, factory A.J. Wells & Sons Ltd cooperates with the Department of Production Engineering, University of Cambridge. Almost every year, students come here to carry out on-site projects and work on the heating technique.Charnwood products are sold in 80% of the local market - in the UK and Ireland. In addition, the device is exported to many European countries, mainly France, Belgium, Holland, Germany and now also to the Polish market. Outside Europe - also arrive in South Africa, Canada, Japan and the Middle East.The idea was to create a founder of the company providing maintenance Wells family. After 40 years of working here for about 180 people, which means that the company is one of the major employers in the Isle of Wight and almost a recognizable global brand furnaces. The new range of Infinity Fires. Warmth, with infinite style and vision. The Infinity range boasts seven models offering a wide choice of sizes, styles and finishes. The fires are all British-made and although they have the contemporary European look, each model is designed to fit perfectly in a British home. 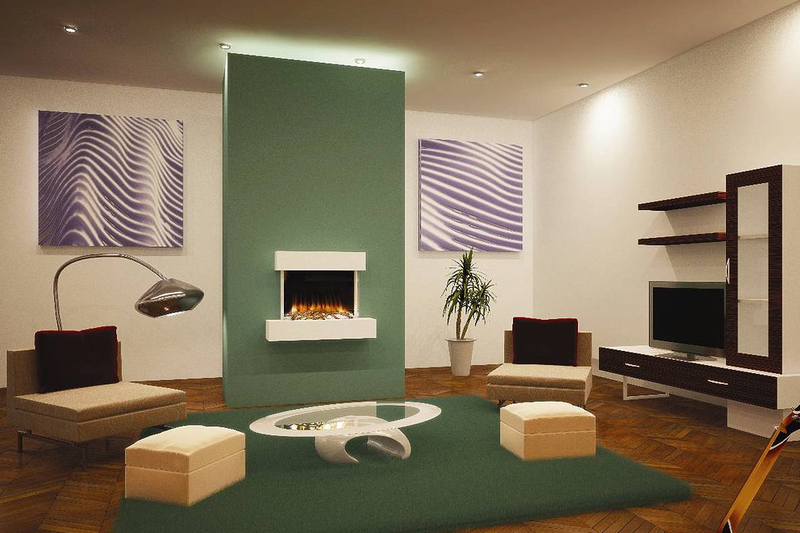 The fires can be fitted into walls for a modern clean look; they can also be incorporated in fireplace suites in a choice of traditional or modern styles. The models are designed to fit most chimneys and 5" flues and are suitable for existing fireplace openings. The Infinity 480FL and the 660PC are also designed, and suitable for use with a pre-cast flue chimney offering a stunning fire and another option to home owners who until now have only had a very limited choice of traditionally designed fires to choose from. Every fires comes with a thermostatic radio frequency remote control that allows you to set the perfect temperature for your room and the fire will regulate itself to achieve this. The remote can also be high level wall mounted, to be used as a wall switch, using the fixing kit supplied. All fires in the range are designed to give a very realistic flame picture from a modest gas input which means no ventilation is usually needed in the room and greater efficiencies are achievable. The Infinity range are exclusive to showrooms and cannot be purchased online or over the telephone. Why not pop into your local store and purchase one of these stunning gas fires today. Generally, the outside of your house dictates the type of decor inside the house. 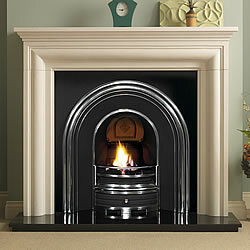 This in turn reflects the type of fire and fireplaces suitable for that particular room. However, today’s trends are contradicting these rules where you can have a contemporary setting within a traditional building. The combination of decor, furniture and fireplace will contribute to the overall character of the room. With fireplaces, materials such as white marble and limestone together with straight lines and square edges portray a minimalistic look. Chrome and brushed steel fires would compliment these types of fireplaces and would create a modern contemporary designer look. On the other hand, traditional fireplaces use curved lines in their designs. Typically, they consist of cream marbles, light and dark oak and mahogany surrounds, black granite back panels and hearths, black cast iron backs and brass fires. When you moved into your home, you might have taken one look at your fireplace and resolved to replace it. Perhaps it just doesn’t fit in with your style preferences and spoils the way your living room, dining room or bedroom looks, or maybe the object doesn’t work properly because it’s old and broken. Fireplaces like this can stop you from making the most of your home. It they don’t function correctly, you might be missing out on the simple and yet important pleasure and comfort that the warmth from electric fires, gas fires and stoves can provide. Also, the whole look of rooms can be ruined by ugly fires. Outdated versions can drag your home back decades in terms of appearance. The trouble is, it’s all too easy to get used to these problems and to put them out of your mind, learning to live with the dissatisfaction you feel with your fireplaces. After a few weeks of inaction turns into months and then into years, you might find the issue slips out of your radar completely. This would be a great shame. After all, there are so many fabulous electric fires, gas fires and other products out there for you to choose from. 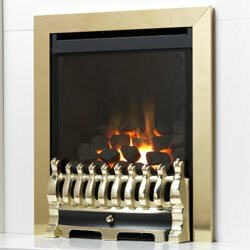 Here at Fire4less we offer a great range of fires at superb value prices. By making the most of these items, you can dramatically enhance the look of your property and you’ll be able to relax and enjoy cosy evenings in the warm glow of the fires. The Drugasar Milo is the ultimate contemporary gas fire – a fire in a 3-sided glass case that stands out as an impressive feature in the living room. The DRU Milo has a large and impressive fire display that can be seen from 3 sides and a floating hearth which is available in either ivory or anthracite finishes. The fire bed offers a choice of rustic twigs, white birch twigs or pebbles. The heat output of the fire is a substantial 7 kW and it can be run on natural gas or LPG. The external dimensions of the fire are 835 wide x 675 high x 648 mm deep. It is operated by electronic remote control. The Drugasar Paco is a versatile corner fire that can be installed to either side of a chimneybreast or turned into a striking stand-alone room feature as our picture shows. It is available in either ‘inset’ or ‘outset’ versions, with frame colours of alu-metallic or anthracite. 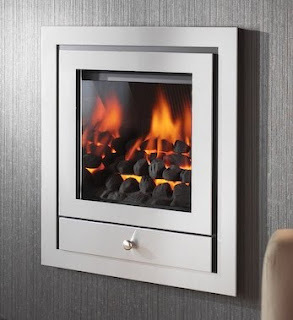 The Drugasar Paco has an impressive, realistic log fire display set off by a fire interior of black polished steel. The DRU patented Vario Burner System creates a wonderful glow all around the hearth, while the flames can be easily adjusted using the DRU remote control, complete with room temperature display. With a heat output of 5.4 kW, Paco can heat a larger than average room without the need for additional heating. This efficient and versatile fire also includes the unique DRU Sandwich Door System for routine cleaning and maintenance. Distinctive, versatile and energy-efficient, Paco is everything you could wish for in a contemporary gas fire. Wood burning fires and stoves have been an essential part of living throughout the ages. However, they are still a part of today’s lifestyle, even though there is maintenance and cleaning involved and the hassle of fuelling them. This is probably one of the main reasons why so many homes choose to install gas fires. A gas fireplace really is very easy to use. In fact, it usually only takes one single touch to ignite a gas fire, and this can often be achieved with a remote control. Furthermore, the fact that they are powered by natural gas means that there is no need to source wood from anywhere or arrange for deliveries of any other type of fuel. A good quality gas fireplace can easily replicate the appearance of a real wood burning fire. Indeed, these fireplaces are available in a wide range of different designs, styles and colours so there is always something available to suit even the most unique of homes. There is still no comparison for a living flame fire. A gas fire is still cheaper to heat up a room than an electric fire. They generally range from 3 kW heat up to 5kW output. So, if you like the idea of relaxing beside a nice warm fireplace without having to worry about getting wood or clearing up mess, take a few moments to peruse the gas fires and stoves at Fireworld. How Much Does It Cost To Fit A Fireplace?